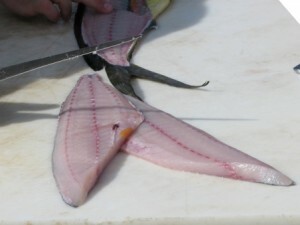 This tutorial page explains how to clean and fillet mahi mahi, also known as dolphin fish. This method produces boneless, skinless fillets. Begin by scaling the fish and rinsing thoroughly. Make cuts behind the head, at the tail, and work the knife back along the body. Lay the fillet down flat and working from the tail end, carefully cut the meat away from the skin. 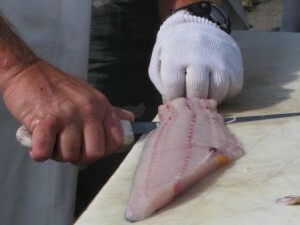 An alternative method cleaning mahi mahi is to remove the skin before filleting. This can be done by cutting the skin around the outline of the fish and then gently pulling the skin away from the meat. This should be done by gripping the skin behind the head with pliers and carefully pulling it towards the tail. If necessary, trim away any meat that does not separate as the skin begins to peel back. Regardless of which method is used to remove the skin, it may be necessary to trim any remaining dark meat from the fillets. 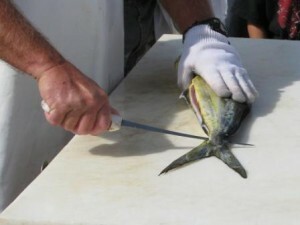 Large mahi mahi can be sliced into steaks after filleting.